I’m a precision rifle shooter—and also a writer. When I’m not writing you’ll find me outdoors with my dogs, or at a shooting range with my husband George. We live in rural Ontario, Canada, just north-east of Toronto. In 1984 we purchased 70 acres of mixed field and hardwood forest filled with maple, hickory and oak, and lined by northern pines. The woods host deer, an occasional wolf or bear, and recently, wild turkeys. Our home sits on a west-facing hill where we enjoy the prettiest sunsets in the country. George owns an automotive garage, and I commute to work at a nuclear plant where I spend my days writing regulatory correspondence and juggling licensing matters. We share our home with two German Shepherd companions, brother-and-sister Romeo and Juliet. Our dear girl Hunter (a.k.a. maniac), died from cancer in 2017. We’ve had a passion for the large Shepherds since I brought our first big boy (Boss) home in 1993. I love the ruggedness of the land carved by glaciers at the edge of the Canadian Shield, and loved taking long walks with Hunter past our shooting range and down to a spring that runs through a cedar grove at the bottom of the property, where she loved to flush partridge and chase squirrels (she never caught one). So that’s a snapshot of who I am, and what I’m passionate about. But I’m neglecting our biggest love—the shooting sports—and above all, the precision rifle. How Did I Get Started as a Precision Rifle Shooter? People ask me, often, how I got interested in shooting. I mean here I am today, having competed in Canada and across the U.S.A, and on three continents in France, Austria, South Africa and Australia. George and I have won major competitions. George trounced the Firearms Industry Super Shoot in Ohio in 2010. I brought home a coveted top-twenty patch from that year’s Super Shoot along with the woman’s heavy gun trophy, and we won the husband-and-wife. Our motto is ‘never quit’. Friends want to know, how do you morph into a world-class precision rifle shooter, winning against top marksmen and women from around the globe? Short answer, I’ve been shooting since I can remember. Starting with bb guns in the basement, and .22 rifle from a kitchen stool rest (‘60s vintage with shiny metal legs and turquoise plastic cushion). You can guess I never was the barbie doll type. No trip to the carnival was complete without stopping by the shooting arcade to win a stuffed toy or other gaudy prize. George and I shot trap through the 1980’s, loading a case of rounds every week. We shot at the best clubs in the country as guests of a friend’s father, and traveled with them many times to the Grand American in Ohio—back in the day when the shotgun range faced the the Dayton International Airport. This was no small shooting event. The Grand American, in normal years, attracted between 4500 and 5000 shooters. Due to airport expansion the Grand came to an end of an era in 2005, celebrating its last shoot in Vandalia. 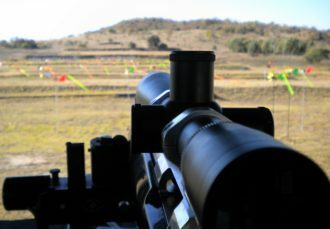 Today we have a 200-yard rifle range in our back yard, where we shoot precision rifle from concrete benches in an enclosed hut that opens out to the range. We don’t practice there much—and likely wouldn’t even if we had unlimited time or resources. 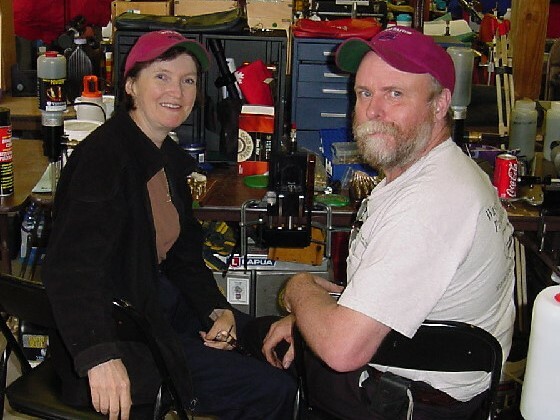 Our practice comes at competitions at our local range in Elmira, Ontario, in the U.S. at shoots in Michigan, Pennsylvania, Ohio, Kansas and Missouri, and as mentioned above, across continents as members of the Canadian World Benchrest Team. How Can You Benefit from my Website? As a precision rifle shooter I want to share my passion with you, the tricks and tips from the shooting range—applicable to many shooting disciplines. I learned from watching and asking, making mistakes, and achieving success. I have exciting stories of triumphs and defeats, the insanity of packing firearms through airports and across borders, and amazing friends that have become our extended family. Come along for the journey to better marksmanship—I’ll show you how to stay on target! Here I want to share my passion with you, the tricks and tips from short-range benchrest—applicable to many shooting disciplines. I learned from watching and asking, making mistakes, and achieving success. Made with for precision shooting! © 2018 PrecisionShooting.com - All Rights Reserved.